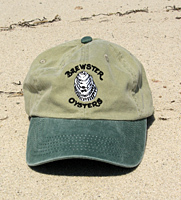 Brewster Oysters logo hats and t-shirts can are available directly from our growers on the flats - come visit us! 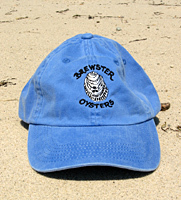 Alternatively, you can also purchase by contacting us at brewsteroysters@gmail.com. 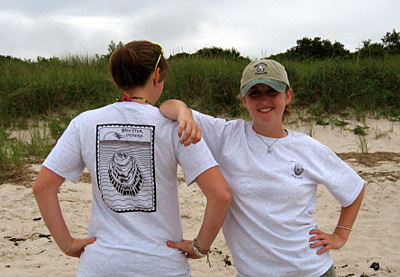 Our t-shirts, designed by local artist/aquaculturalist Antoinette Young, are currently available in various colors with a complete range of sizes from extra small to extra large. 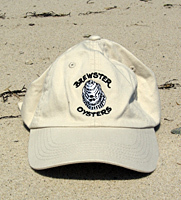 Shirts are high quality 100% cotton, preshrunk with the Brewster Oysters mini-logo on front and our full logo design on back. 100% cotton twill, stonewashed for that trendy faded look with our mini-logo on front. One size fits all.